Digital cameras commonly store photos as high-resolution files suitable for print, but that high-resolution is more than you need for display on a blog or website. And you probably don’t want to make your blog visitors download a great big image when they don’t need to. Usually, you compress the file size of your image when you plan to put it on your blog. If you plan to upload your image to Flickr, don’t worry about compressing the image when you export. Flickr can handle large files and can resize the photo for you. You may also need to change the image’s dimensions in order to fit it into your blog layout, or even create a thumbnail version. In Picasa, compressing — also called setting the image quality — and resizing a photo actually occur when you export the image. You don’t need to deal with these issues until after you do all your other edits. When you export, you create a file that you can upload to your blog, so don’t skip this step! Click the Export button at the bottom of the Picasa window. The Export to Folder dialog box opens. Click the Browse button and select the location on your computer where you want to save the file that you’re exporting. To resize your image, click the Resize To radio button below Image Size Options and enter a pixel width that you want to use for your new image in the text box below Resize To. You may need to experiment to find the right pixel width for your particular blog design, but a good rule is to choose a pixel width of 400 pixels because many blog templates tend to hover around this width. You can also use the slider bar to the right of the pixel text box to change the width. Select an Image Quality setting from the Image Quality drop-down list. For web graphics, Normal is a good setting to choose because it has a good balance between image size and file size. 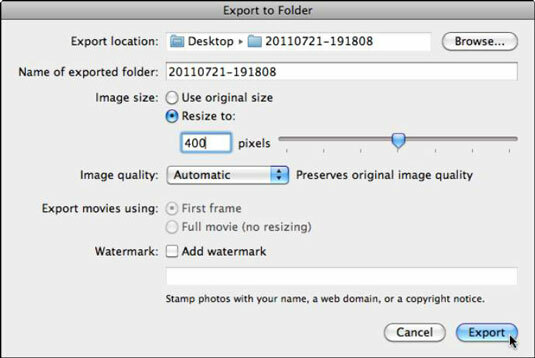 Picasa exports your image to the folder you chose in Step 2.